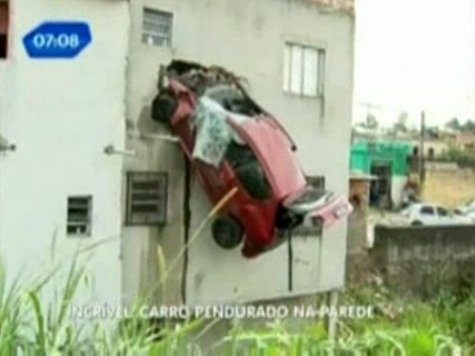 A 25-year-old man from Sao Paulo in Brazil had a miracle escape when he lost control of his red Peugeot, flew over a gully and ploughed into the second floor of a house. Eight people, including five children, were reportedly sleeping in the apartment at the time, but incredibly no one was injured. Firefighters rescued the driver (who had no driving license) by lowered him to the ground with a rope. 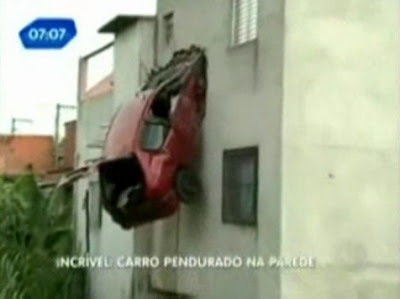 It makes you wonder what speed he was doing!